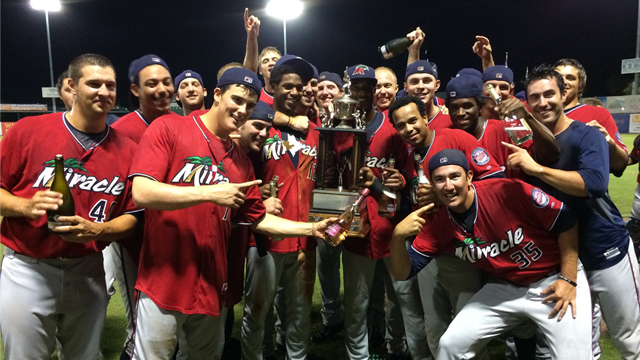 Miracle win the 2014 FSL Championship! DAYTONA BEACH, Fla. (September 8, 2014) - Jason Kanzler's two-run homer in the eleventh inning propelled the Fort Myers Miracle to the Florida State League Championship in a 4-2, extra inning win over the Daytona Cubs at Jackie Robinson Ballpark in game four on Monday night. Tied 2-2 entering the eleventh, Adam Brett Walker doubled off Cubs reliever Steven Perakslis to lead off the frame. Tyler Grimes then failed to put down a sacrifice bunt, popping out to the catcher. Kanzler stepped to the plate. On a 1-1 pitch, Kanzler sent a soaring drive that cleared the wall in deep center field to put the Miracle up 4-2. The home run for Kanzler was his second of the postseason and pushed his RBI total to eight. In the bottom of the eleventh, Miracle manager Doug Mientkiewicz called on Zack Jones to enter out of the bullpen. Jones retired the first two hitters on groundouts to short. Then, Jones fanned Wilson Contreras on three pitches with a 98 mile per hour fastball to seal the FSL Championship and the Miracle raced onto the field to start the celebration. A tightly contested game, the Miracle pulled out to an early lead with a run in the first inning. Aderling Mejia led off with a walk coaxed from Cubs starter Rob Zastryzny. Niko Goodrum then laid down a sacrifice bunt to move Mejia up to second base. A wild pitch from Zastryzny advanced Mejia to third and Travis Harrison brought in the first run of the game with a sacrifice fly to center field, 1-0. Fort Myers extended the lead to 2-0 with a run in the fourth. Stuart Turner and Max Kepler started the inning with back-to-back singles. Walker struck out, but Grimes yanked a double off Perakslis into left field for a RBI and two-run lead. The Cubs clawed back into the game on a pair of errors. Miracle starter D.J. Baxendale hit Kyle Schwarber with a 2-2 pitch to put the lead-off man aboard. Dan Vogelbach then hit into a force play and replaced Schwarber at first base. Bijan Rademacher laid down bunt single to put runners at first and second. After Baxendale struck out Billy McKinney, Contreras hit a ball to third base. Goodrum attempted to throw to second, but missed the bag and Vogelbach scored, 2-1. Daytona pushed across another unearned run off Baxendale in the sixth. Vogelbach led off with a double down the right field line. Rademacher struck out, but McKinney earned a walk. Contreras then hit a sharp grounder that eluded Grimes at second base and allowed a run to score and tie the game, 2-2. Baxendale exited after 5.2 innings in a no decision. Piling up seven strikeouts with three walks, Baxendale gave up two unearned runs on six hits. Brandon Peterson entered in the sixth and struck out Ben Carhart swinging to end the frame. Peterson remained on the hill for a perfect seventh. Mientkiewicz then brought in Nick Burdi in the eighth. Burdi put together a 1-2-3 eighth and then struck out all three batters in the ninth to force extra innings. D.J. Johnson entered out of the pen in the tenth. After surrendering a game-winning homer to Contreras in game three on Saturday, Johnson worked out of a two-out, two-on jam to set the stage for Kanzler's heroics in the eleventh. The FSL Championship is the first-ever in 22-year team history since moving to Fort Myers in 1992. The Miracle also defeated the Cubs in a FSL playoff series for the first time in Daytona team history. The Cubs are now 12-1 in postseason series. The Miracle finish the season with an 87-58 overall record and were 4-1 in the playoffs.